News.com’s Gadget Blog is reporting that the iPhone may be released on June 11th. While this is a Monday, not a typical release date for Apple, the source came from the sales department at Cingualr itself. Personally, I find this whole thing a little on the fishy side. And who know if there is even an official date set yet. However the sooner the better! Ever since Steve Jobs’ keynote at the Macworld Expo in January, we’ve known that the iPhone is being released sometime in June. But we haven’t known exactly when. 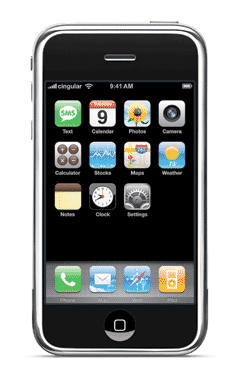 Now Cingular is confirming that the release date will be June 11. A customer service manager at Cingular (we called 800-947-5096 and were transferred to sales) gave us that date late Thursday, but, alas, said he didn’t have any additional information beyond that. Rumors have been swirling about the iPhone release date. One blog pointed to a release date of June 15 based on alleged documents filed with the Federal Communications Commission, but those have been shown to be a hoax.